I try to stay away from fancy sounding recipes. I know they say not to judge a book by its cover, but sometimes I judge recipes solely based on the titles. If it sounds remotely complicated, I’m out. So I’m not quite sure what drove me to try this ragout recipe that I found in the most recent edition of Fitness magazine. Because let’s be honest, I had to look up “ragout.” (Per Merriam-Webster, it is well-seasoned meat and vegetables cooked in a thick sauce.) Whatever it was, I think it has to do with my new found love for baby portabella mushrooms. While this dish doesn’t contain any meat, it is deliciously rich. And probably one of the most uncomplicated complicated sounding meals I’ve ever made. From start to finish, it took me approximately 30 minutes to throw this one pot meal together. I mean, you can’t go wrong with onions and mushrooms cooked together in olive oil, combined with spices and tomato paste and simmered to perfection with sweet balsamic vinegar. And the kale, poached eggs, and toast just help bring everything together. I should mention that while this dish was a part of last week’s meal plan, I (of course!) forgot to buy a few key ingredients. But hey, at least it still turned out great. Blog-worthy even! I should also mention that my egg poaching skills need a little work. I checked on them every minute, but I think I overestimated the amount of time needed because my eggs were a tad bit overcooked. And the fact that my photography skills need a little a lot of work doesn’t need to be mentioned, but trust me when I say, my version of ragout tastes 100x better than it looks. There are no words, except that I will definitely be making this again very soon. 1. In a large skillet, heat oil over medium-high heat. Add mushrooms and onions. Stir occasionally and cook until both have softened (about 10 minutes). 2. Add garlic and cook for another 2-3 minutes. 3. Add tomato paste, parsley flakes, oregano, salt, pepper, and balsamic mixture. Stir and cook for another 3-5 minutes (the liquid should start to reduce). 4. Add kale and toss until wilted (about 2 minutes). 5. 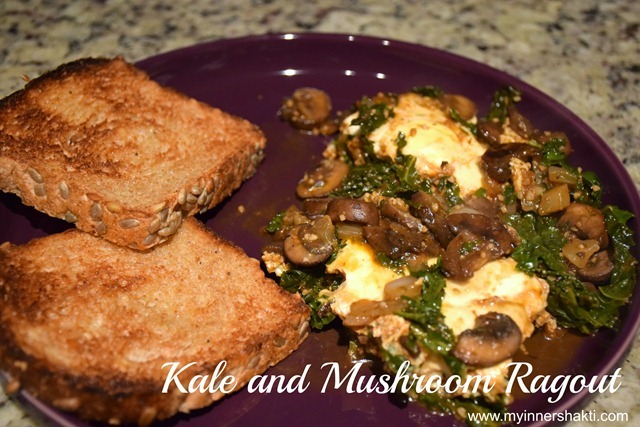 Using a spoon, create 4 indentations in the mushroom-and-kale mixture and drop an egg into each. Cover the skillet and cook until eggs are set, about 7 minutes (original recipes suggests 3 minutes). 6. In the meantime, turn on the broiler. Spread butter on one side of each piece of bread, arrange on baking sheet and broil for 2 minutes (or until just browned). Serve with ragout. And congratulations to my e-cookbook giveaway winners – Zarine, Liz, and Neeha!! Now you three will be able to enjoy Dixya’s recipes as well! I’ll email you today with more information. What’s the fanciest sounding dish you’ve ever made? That looks absolutely delicious- as an avid meat eater, I reckon mushrooms take the meat (baha) as the vegetable most resembling a protein. Any salad with a fancy dressing can make something so bland sound better than it is. Many restaurant errors with that happening. Best. Combo. Ever!!!! I would have to sub the egg for something else, but this sounds insanely delish. I’m into it!